It has been a good year for the HPG and we've had two "Christmas" presents as of late: a caboose and a log car, both true artifacts of the WI&M Railway's history. 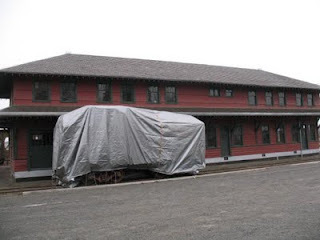 The HPG's mission has mostly focused on preserving the Potlatch depot, but the goal is also to give tribute to the WIM's successful and colorful history as a short line. We came across an interesting article in the August 31, 1972 issue of the Daily Idahonian, entitled "WI&M Ry. Chugs Ahead to Profit." It noted that the railroad "reversed its long history of red ink, and last year a dividend was paid for the first time." Neal McKellips, the short line's auditor and co-manager along with Bill Lemke, said higher freight rates and improved railroad practices led to the turnaround. The article also mentioned that the line at that point leased its engines from the Milwaukee Road and boxcars from the Burlington Northern or Milwaukee Road, depending on destinations. McKellips admitted that having the Milwaukee Road logo plastered all over the engines presented the WI&M with something of an identity crisis, so he had some magnetic signs made to cover the Milwaukee Road logos. 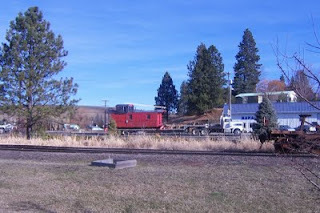 A photo accompanying the article pictured Old Number One in front of the depot, with an explanation that the locomotive was later sold to the City of Potlatch for $1 and had since become a tourist attraction. Rolland Meyers has been hitching rides on the STMA for the last 20 years and has filmed the line extensively. 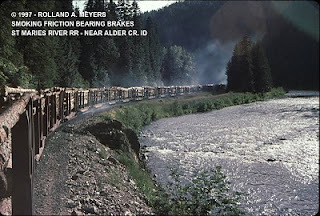 He's sent some photos our way to show how things looked in the past when long log trains chugged out of the back country. Chances are, many of the cars pictured have already been dismantled for scrap. Thanks to Rolland, however, we now have one of the historic cars for the HPG. Next week, Stan Patterson and the W&I Railway will hook the log car to the Bennett shipment and bring it up the line to the depot. Hopefully we can get some photos of that. With a caboose and the Benx car already in WIMHPG ownership, it does look like the HPG is out to amass a whole railroad. Today, thanks to volunteers from Jack Buell Trucking and Bennett Lumber Products, a 1940s-era log car was delivered to Princeton. 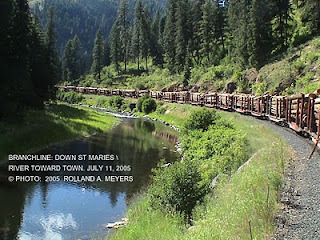 The log car, once under Milwaukee Road ownership, was trucked from St. Maries to Bennett Lumber, and will ride the rails sometime next week to its new home by the depot, thanks to the Washington and Idaho Railroad. We appreciate Rolland Meyers getting the ball rolling on this project. 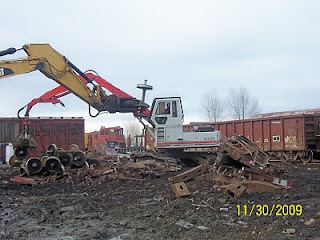 With the St. Maries Railroad in the process of scrapping all 476 of its flat log bunk cars (see photos above, taken at the St. Maries scrapping operation), Rolland managed to get one for the HPG. According to Jim West, 230 cars have already been dismantled for scrap, but this one has been spared as a piece of logging and railroad history. Many thanks are in order on a project like this. Jack Buell Trucking, with Frank Buell doing the hauling. Ed Katus was the point man at Bennett Lumber, with Jeff Iverson running the large Bennett crane, and Dean Beyers and Carroll Stephenson assisting with the off-loading procedures. And last, but certainly not least, thanks to the St. Maries Railroad and Potlatch Corporation for donating the car! Such donations are no cheap date and we appreciate the help and encouragement. Scrapping photos courtesy of Jim West. The temperatures have been single digit and it was timely that the caboose was moved safely last week. Once again Doug Wasankari and crew went the extra mile, helping HPG folks wrap this great piece of WIM history. Granted, it is isn't as flashy as showing off the rail car, but the tarp will prevent further deterioration until we can restore X-5. In the meantime, Jim West sent another batch of photos of the move, some of which we display now for our readers. Notice Don Somers leading the parade---literally. Don was a real stalwart, staying out in the cold with crews throughout the move. And Jim broke free from all his Boise meetings to be there for some help and good photos. Jack too attended when duty called, and among the three, all expressed relief that the caboose is finally in place. You don't just pick up a caboose and move it. That was made clear as the precision team from Wasankari Construction did their job to keep the wooden car stable for its move. Offloading the caboose from the lowboy, jacking it up so the trucks could be put underneath, and stabilizing it through each phase required patience and know-how. Pictured taking an infrequent break are Rob Morgan, Teddy Bailey and Alan Shepherd, all long-time employees for Doug Wasankari. Also pictured are members of the HPG who joined the Wasankari team to move the trucks into place. As the caboose pulled into Potlatch on Thursday, past WIM employee Scott Winther stopped by to watch (Scott is pictured in the blue jacket as Jack Coyner and Don Somers join him). Both Scott and his dad were railroad men, and Scott remembers bunking a few times in cabooses when his shifts prevented him from going home. He said one of his coworkers would put on a pot of stew at Potlatch, and by the time the train pulled in at Bovill, Scott had dinner ready. 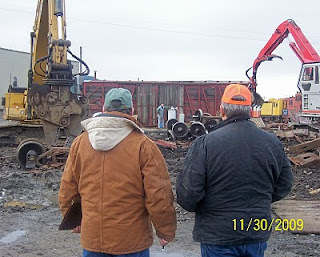 As Jim West (in orange vest) and Jack Coyner toured the caboose, both were impressed at how much of the interior was still intact. The caboose interior design seemed the model of efficiency with its woodstove, refrigerator, bunk, viewing area and storage. 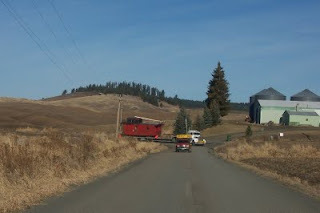 A piece of history rolled into Potlatch today as Wasankari Construction safely transported a vintage WI&M Railway caboose from Farmington, Washington to its new home next to the Potlatch depot. The bright red cargo arrived around 11:30 am. 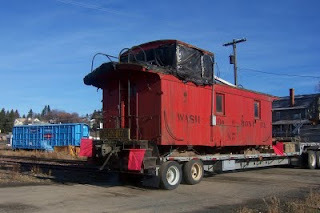 According to HPG Historian Tom Burg, the caboose was built by the Northern Pacific Railway in 1909, and sold in 1955 to the Washington, Idaho and Montana Railway, along with another caboose. These replaced WIM cabooses X-1 and X-2, which were retired, and the newly acquired cabooses were painted yellow and lettered in black as X-4 and X-5. In 1962, the Milwaukee Road took over the WIM ownership, and the X-5 was subsequently painted orange with black lettering to match the Milwaukee Road locomotive colors. 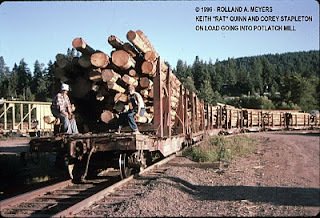 Both cabooses went into retirement in 1969, with the X-4 becoming a cabin on Lake Coeur d'Alene. The X-5 went to Gene and Connie Rambo's where Connie used it for her ceramics hobby. Tomorrow is the target date to move the WIM caboose from Gene and Connie Rambo's farm in Farmington, Washington to the depot property in Potlatch, so there was much prep work to get the little car ready. Ever faithful, President Don Somers arrived early to remove the plastic and do other prep work before Doug Wasankari and his able crew showed up. These guys are a precision team and it's fun to watch each step, from raising the caboose up high enough, to backing the lowboy under it. Fractions of inches count in this game. The day was sunny but chilly and Connie spent time visiting with Don, Jack and Barb before doing her afternoon school bus route. She said Jim West had phoned from his meeting in Boise to check on the progress. When son Ryan joined the gallery of spectators, we learned just how long the caboose has been at the Rambo farm. Connie recalls that Ryan was about 8 or 10 when the car was brought in, and Ryan is now 47, so do the math. Although the caboose is paint chipped and in need of restoration, it appears basically very sound. Doug has chosen the route via Yellow Dog to get the cargo safely to Potlatch. 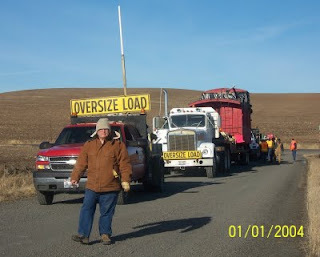 Today's photos show Doug and his crew jacking up the caboose, then loading it on the lowboy. Notice that the painted lettering identifies the caboose as X-3 instead of X-5. We will give more historic details from Tom Burg in the future.